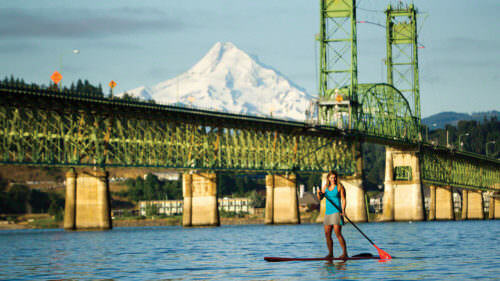 Bend has long been mecca for folks who enjoy recreation in the great outdoors. 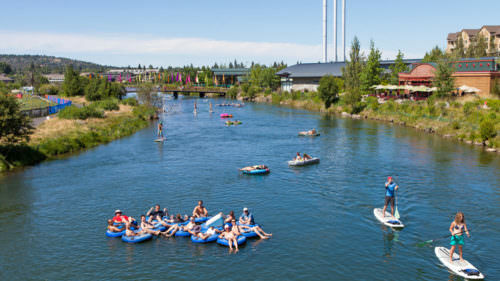 Now, there’s more good news: the first whitewater park in the state has been completed and promises a thrill ride for kayakers and surfers or folks who like a leisurely trip down the Deschutes River. The concrete bunker is the nerve center of Bend’s new Whitewater Park. The new park is the result of a voter approved $29-million dollar local bond measure for varied civic projects including the replacement of the century old Colorado Avenue Dam. Richard’s is the new park’s “wave shaper,” which means he and his iPad are linked to the computer in the bunker that controls the amount of air that is pumped into each of the 24 bladders – essentially air-filled balloons – that, in turn, shape waves on the 200-yard stretch of river. Atop the new pedestrian bridge that overlooks the whitewater stretch, Ryan demonstrated how he uses the iPad to inflate one of the bladders immediately below us. 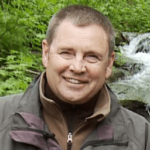 As the bladder filled with air, the rubber panel that’s attached to the top of the bladder began to lift up and divert the water into a wave. The new Whitewater Park’s Construction Manager, Brian Hudspeth, said that the former Colorado Avenue Dam was built in 1908. Its purpose was to help hold back water for the upriver log pond that was used to store logs during Bend’s heyday as a mill town. Bend’s new Whitewater Park required engineers to not only remove the old dam but then move the river back and forth from shore to shore several times over the past year so to create three distinct channels: A safe passage channel for people who float the river, a whitewater rapid channel for kayakers and surfers and finally a wildlife habitat channel.